If games were awarded for effort, commitment and grit then our reserve footballers would have fully deserved the spoils on offer when they played Doohamlet in the Platinum Tanks reserve football league on Wednesday 4th June. 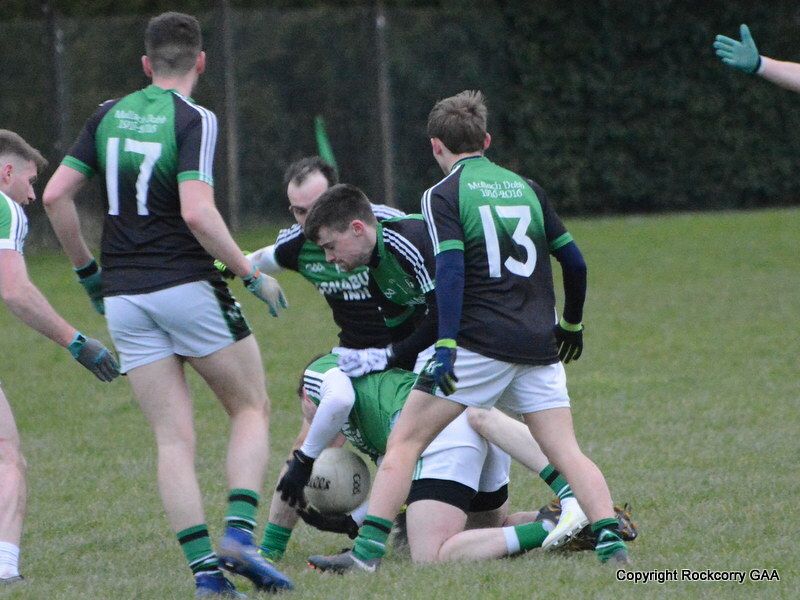 The match was action packed and the lads showed plenty of honest endeavour and there were some really great individual battles all over the field. 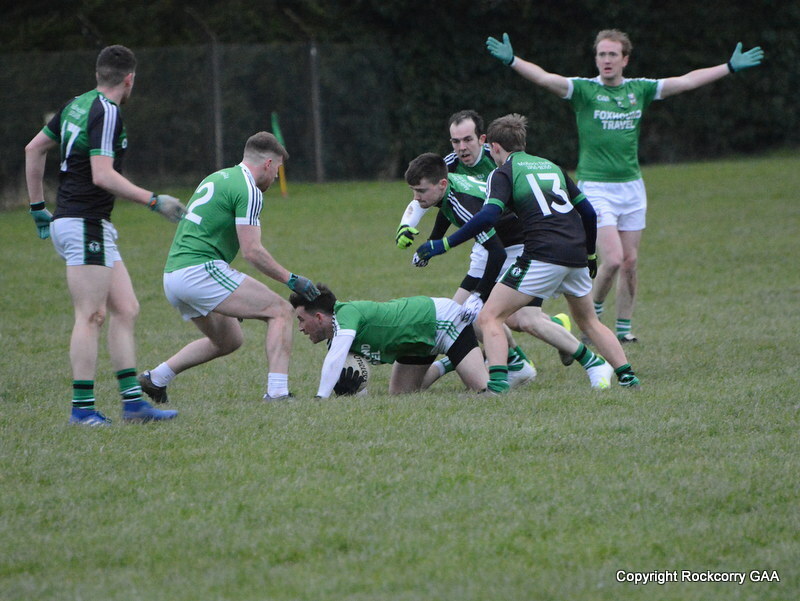 However, as we all know the main objective and aim of the game is to out-score your opponents and two goals during the second half proved vital for Doohamlet as they claimed the victory on a final score-line Rockcorry 1-8 Doohamlet 2-10. 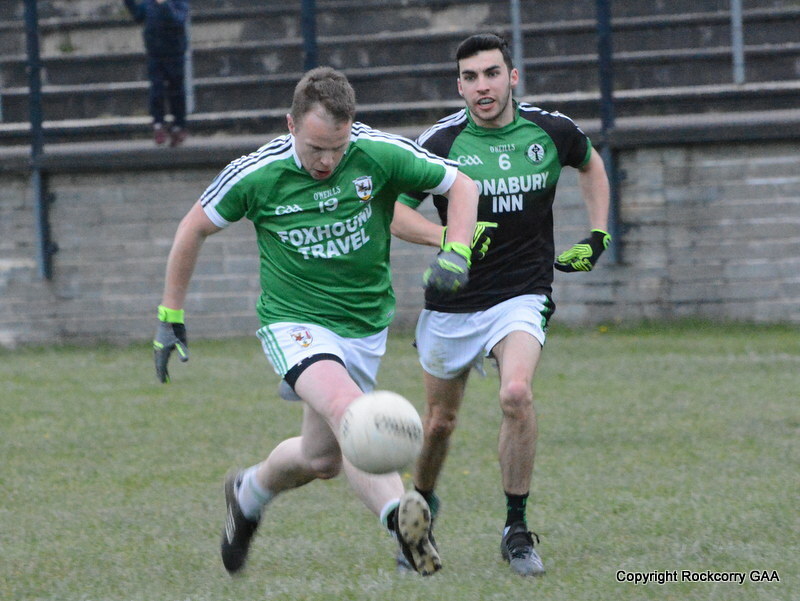 The game was played at a glorious sunswept Pairc Naomh Mhuire and while we started as clear underdogs we started in whirlwind fashion and opened the scoring on the 2nd minute when Dwayne Rooney converted a free-kick. We had a couple of scoring chances, on the 5th and 8th minutes, to increase our lead but surprisingly attempts from Mark Thornton and Dwayne Rooney drifted wide. Doohamlet registered their first score on the 10th minute with a neat point from play and when they broke through our rear-guard a couple of minutes later they had a goal chance but thankfully Aaron Clerkin showed quick reactions and pulled off a great save. We maintained a high tempo and controlled the proceedings and had further scoring opportunities on the 13th and 14th minutes but efforts from Garry Calvert and Ross Murray were also off-target. The lads were working hard and played some free-flowing attacking football and on the 17th minute when Andrew Carroll, Owen Fitzpatrick and Christopher Greenan combined to set-up Dwayne Rooney he got in behind the Doohamlet defence and blasted an unstoppable shot past the goal-keeper to raise a green flag. Doohamlet responded immediately when they tapped over a free-kick to leave the score-board showing Rockcorry 1-1 Doohamlet 0-2 after twenty minutes. We continued to enjoy the majority of possession and put together some nice attacking moves but our finishing was letting us down as efforts from Andrew Carroll on the 21st minute and Dwayne Rooney on the 22nd and 23rd minutes were again off target. At this juncture we were starting to get anxious with all the wide’s but we eventually managed to add another score when Colin Quinn curled over a delightful free-kick to settle and calm the nerves. 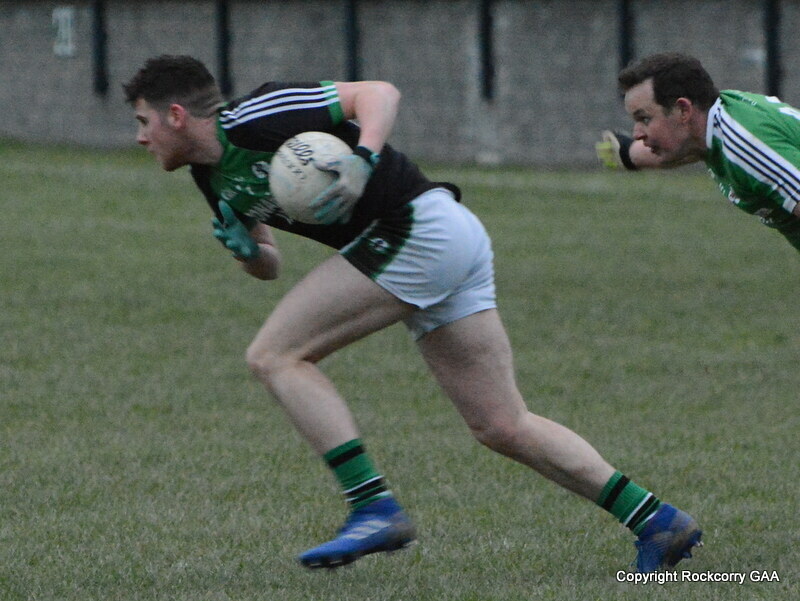 On the 24th minute, Cathal Sheridan was adjudged to have fouled his opponent and they duly lobbed over the resultant free-kick and shortly afterwards they added another point to leave the score-board showing 1-2 to 0-4. The hard working Dave McArdle showed his finishing panache with a confident strike on the 27th minute and with half time approaching Colin Quinn slotted over with a super effort after good a good build-up that included Owen Fitzpatrick and Mark Thornton to leave the score at the half-time interval Rockcorry 1-4 to Doohamlet 0-4. We started the second half how we finished the first and when Cathal Sheridan thwarted a promising Doohamlet attack we broke down the field at pace and Ryan Sharkey completed a fine move in style to move us four points ahead. It was Doohamlet who were the more economical with their possession over the next seven minutes as they replied in a positive fashion and hit their stride with three unanswered points on the 3rd, 4th and 8th minutes to reduce the deficit back to a single point, 1-5 to 0-7. During the half-time pep talk, Dave McArdle was challenged to add another score to his tally and he did not disappoint because when he collected the ball on the 9th minute he skipped past a couple of tackles and dissected the uprights with aplomb. With both sides jostling for the initiative the next eight minutes or so neither team added to their tally as both teams exchanged a number of wide’s but Doohamlet managed to tag on a point on the 18th minute from a free-kick. Two minutes later we were severely punished when a wayward hand pass gave Doohamlet possession in a vital area and they hit the back of the net to take a two point lead, leading 1-6 to 1-8. You wouldn’t normally associate the name of Owen Fitzpatrick on the score-sheet but when he drove forward alongside the energetic and flamboyant Garry Calvert he showed remarkable ability and composure to finish with a truly amazing point to cut the gap back to a single point. The game was now in the proverbial melting pot and with only one point separating the teams with five minutes to go it could have swung either way. However, it was Doohamlet who seized the advantage when they converted a free-kick on the 26th minute and shortly afterwards we were guilty of over-elaborating and sadly another misplaced pass in defence gave Doohamlet possession and they hit the back of the net to give them a 1-7 to 2-9 advantage. 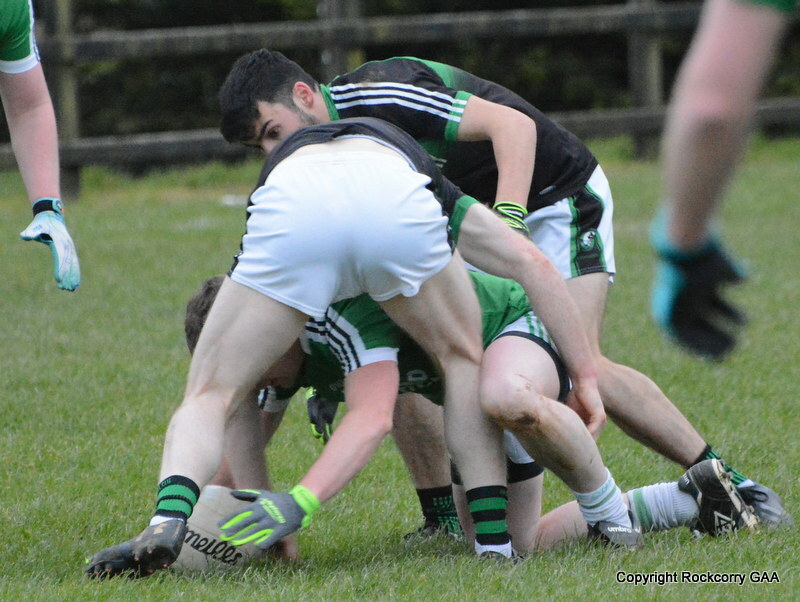 As the saying goes “it’s a man’s game” and there is something impressive about a well-timed shoulder but I also thick there is a very fine line between a well-timed tackle and a late tackle! When Doohamlet surged forward, on the 28th minute, Felix ‘The Grizzly’ Granaghan somehow got back to execute a perfectly timed, bone crushing, thunderous shoulder on the edge of the square that prevented an almost certain score. Dwayne Rooney added a point on the 29th minute and while we piled on the pressure during the closing minutes in search of further scores we couldn’t break through as Doohamlet defended stoutly and as the game entered additional time Doohamlet wrapped up the scoring with a point to seal the win on a score-line Rockcorry 1-8 Doohamlet 2-10. Team & Scorers: Aaron Clerkin, Garry Calvert, Cathal Sheridan, Christopher Greenan, Colin Quinn (0-2, 1f), Ross Murray, Ryan Sharkey (0-1), Mark Thornton, Owen Fitzpatrick (0-1), Dwayne Rooney (1-2, 1f), Dave McArdle (0-2), Kyle Rooney and Andrew Carroll. Subs. Dean Fay for Kyle Rooney and Felix Granaghan for Dave McArdle.